North Luangwa National Park is a national park in Zambia, the northernmost of the three in the valley of the Luangwa River. Founded as a game reserve in 1938, it became a national park in 1972 and now covers 4,636 km². 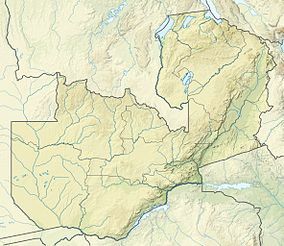 Like the South Park, its eastern boundary is the Luangwa River, while it rises to cover a stretch of the Muchinga Escarpment to the west. The Mwaleshi River flows east–west through the centre of the park, the area to its south being a strict wilderness zone. Wildlife is widely found, including Cookson's wildebeest, Crawshay's zebra and many antelopes and birds. Elephant numbers have recovered from poaching in the 1970s and 80s. The struggle against poaching in the park was described by Delia and Mark Owens in their book The Eye of the Elephant. For many years its wildlife suffered greatly from poaching, but recent years have seen poaching almost entirely stopped. It has generally suffered from a lack of investment and interest compared to the much more popular South Luangwa National Park, although its flora and fauna are very similar to its southern counterpart. In 2003, black rhinoceroses were re-introduced to the park. Since 2005, the protected area is considered a Lion Conservation Unit together with South Luangwa National Park. This page was last edited on 7 September 2018, at 10:59 (UTC).